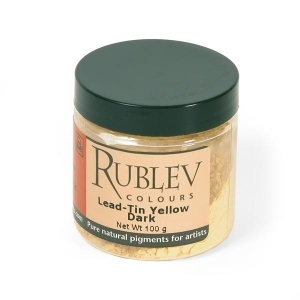 Details Lead-tin yellow light (type I) is an artificial pigment made by heating lead and tin oxide together and frequently occurs in European painting before the 18th century. Lead-tin yellow frequently occurs in European painting before the 18th century. 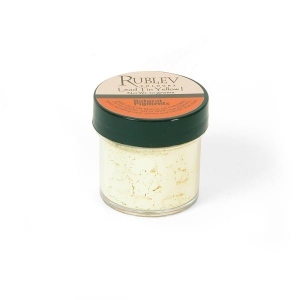 The earliest recipes for a yellow pigment from lead and tin was found in the Bolognese manuscript from the first half of the fifteenth century. Old Italian manuscripts make reference to a pigment of pale yellow color called giallolino or giallorino while northern manuscripts use the term massicot (which now designates yellow lead oxide) to describe a pigment prepared from lead and tin. There are, in fact, two types of lead-tin yellow, designated as types I and II. Type I is lead-tin oxide and is most frequently found on old paintings. Type II is a second variety of lead-tin oxide that may contain free tin oxide and additional silicon. Possibly both types were used as opacifiers in ancient glasses. 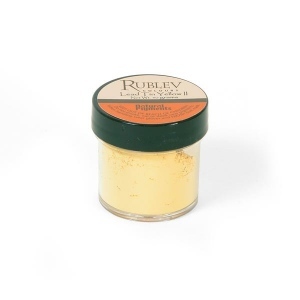 Lead-tin yellow (type I) is prepared by heating in a crucible a mixture of lead dioxide and tin dioxide to a temperature of about 800° C. Warmer hues of yellow appear at lower temperatures and at about 700–800° C, the more lemon-colored hues develop. Lead-tin yellow is not affected by light and is stable under normal atmosphere. On paintings, lead-tin yellow (type I) has been found mixed with lead white, vermilion, yellow lakes, ochres, verdigris, indigo and azurite. 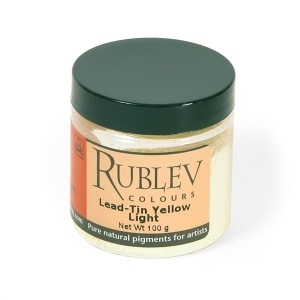 Lead-tin yellow a small amount of oil (16 g oil per 100 g of pigment). It is a fast dryer in oil paint and forms an excellent film. Lead-tin yellow contains lead and is poisonous. Utmost care should be used in handling the dry powder pigment to avoid inhaling the dust.